These stats have been, thoughtfully, provided by our local management for western Essex County for the first 8 months of 2013 vs. the same period last year. The numbers come from the Garden Stage Multiple Listing Service and are for residential properties only. Multifamily properties are not represented here. You can click on the chart to bring up a larger image. I track the numbers for Montclair, Glen Ridge and Bloomfield every month, as well, and I’ll show graphs for the year for those towns in next month’s post. You’ll notice right away on this chart that the number of listings is down for the year in 2013 in every town with an average of 24.6% less listings overall, on average, from 2012. This reflects the lack of inventory we have experienced this year (and which always seems to be the case when prices are on the rise – more about prices later). This number may soften and listings increase as prices continue to rise and sellers become more confident about listing their homes for sale. Don’t forget, 2013 was the first full year of market improvement where sellers might believe they would get their price. As time goes on and more and more sellers put their toes in the water, listings will increase but then prices may stabilize with more supply (again, price info and analysis to follow. Also, I am ignoring the amount of new listings on the chart for the month of August which is, traditionally, one of the slowest months of the year). Right now we have increased consumer confidence from buyers and more demand as a result of continuing good economic news, job security and job growth. You’ll notice a dramatic change in the “absorption rate”, that’s the amount of time it takes the market to “absorb” (sell) the inventory available, expressed in months. Every town but one is experiencing this decline with an overall decline of 42%, on average, from the same period in 2012. That’s an eye-catching number. The market is absorbing the available inventory almost twice as fast as it did for the same period last year. There is only a 2.9 month’s average supply of inventory for 2013 with some towns, Montclair and Glen Ridge, for instance, showing a supply of only 1+ month. This kind of market condition leads buyers to “get on their horse” and compete for housing with multiple offers becoming more and more common. Currently, demand outstrips supply and that will lead to higher listing and sales prices for as long as that condition persists. The chart also shows an increase in listing prices for all but a couple of towns with an overall increase of 7.6% for the 8 month period, on average. Total closings are up, overall, by 17% with all but a couple of towns showing individual increases in volume. More closings with less inventory shows a robust, improving market. Average DOM (days on market) is also down an average of 11% which is a factor leading to an increase in sales prices of 7.2% for the year over year, so far. This is even greater than predictions, which were anywhere from 3% to 6%. The predictors worried that yearly price increases over 3% might signal an unsustainable bull market and that has yet to be determined. If listing prices were up 7.6% and sales prices are up 7.2% it shows that sellers are doing well and buyers are serious. There were some slips in the number of contracts and sales in the last couple of months, nationwide, but that may be seasonal, the result of slightly higher interest rates as the economy improves and may also reflect an averaging of very different regional markets. There were, however, some markets whose prices improved in double digits. The housing market seems to continue to shrug off every crisis our fractious (I chose my adjective carefully) Federal government generates. 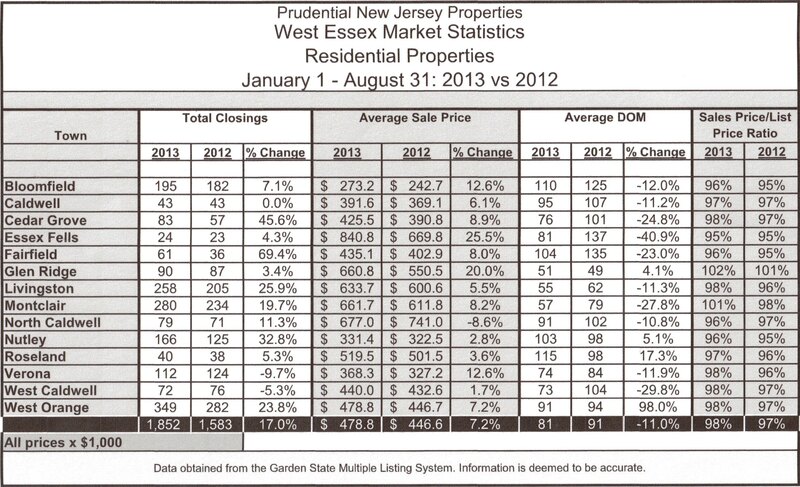 In western Essex County there were some eye-popping double-digit price increases from 2012 for some individual towns. And, every town, individually, except North Caldwell (where prices are high already – it’s where Tony Soprano lived, after all), showed a gain in sales prices. 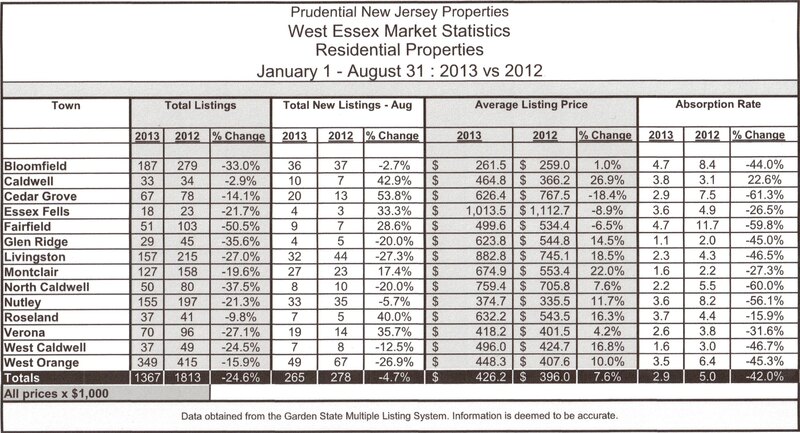 Finally, how did sellers do in 2013 vs. 2012 in what they got vs. what they asked in price? Every town gave its sellers a return in the high 90’s percentage points with an overall return of 98% on average for 2013 which is 1 percentage point better than 2012. 1% may not sound like much but, don’t forget, we’re dealing in hundreds of thousands of dollars and 1% of that could equal a lot of cash. In Montclair and Glen Ridge sellers were getting more than they asked by a point or two. In those towns, where the average selling price is in the $600,000 range, a couple of points could represent a five-figure bonus. So, where are we going from here? All indications point to more of the same for the next two or three years until the next cycle swing takes effect. The pundits are saying, also, that when the cycle presents its next inevitable downturn it will be mild and nothing like what we experienced four or five years ago. I see my buyers becoming more and more disciplined with even the most conservative willing to accept my advice to compete to win. My sellers are, overall, much more practical and are accepting my recommendations on price more readily which tells me they are less fearful. I’m glad that everybody’s happier these days. I look forward to it continuing without the blood sport that results from a depressed market. I’ve had enough of that in the past few years to last me a lifetime and I’m ready for something calmer.